Right that's me done for today. Thanks for joining me. Are Premier League clubs giving the full picture on attendances? Has Rashford's end product put pressure on Sterling? Thanks for joining me and I'll see you soon. Neil: I'm now 67 and playing walking football every Thursday. Lets say Friday morning is a bit like wooden legs! I could almost use this one as a celebrity Get Involved! According to the Daily Mail the Arsenal and Switzerland defender Stephan Lichtsteiner, 34, has rubbished reports of retirement and claims he has the body of a 28-year-old. Lichtsteiner has made one substitute appearance since joining the Gunners from Juventus in June. No wonder he feels so fresh - though chasing Marcus Rashford on a Tuesday night is enough to shake that belief! Republic of Ireland manager Martin O'Neill is keeping his fingers crossed that captain Seamus Coleman will be fit for October's Nations League double-header against Denmark and Wales. The Everton full-back travelled to Poland for Tuesday night's 1-1 draw with the rest of the squad despite being ruled out of the game with a foot injury sustained in Thursday night's 4-1 defeat by Wales. Speaking afterwards, O'Neill told RTE Sport: "Seamus went for a scan. He has a little stress fracture, which is a concern. He could easily have got a flight home, but he stayed with the team. "He is a great captain, a really great captain. He is inspirational and obviously we hope he is back in time for the games coming up." Coleman suffered a double leg fracture against Wales in March 2017 which kept him out for 10 months. Terry McCann: At 51 I'm in the best shape of my life, pity I'm at the age no one cares about it! I hope that's not true Terry. Now for some news coming out of Italy. It seems that German midfielder Sami Khedira has signed a new two-year contract with Juventus that runs to 2021. The 31-year-old's contract also has option of an additional year. Attendances - Are fans getting the full picture? Admit it, we've all watched a football game where we've heard or seen an attendance figure and then looked around and done a double take. So this piece by my colleague Alistair Magowan is interesting to say the least. He's been looking at the discrepancies between football clubs' published attendances and the actual figures held by some local authorities (police and councils). Anyone remember Valeri Bojinov? Not exactly a household name is he. But the former Manchester City striker who has played for 14 clubs in his Italy, England, Portugal, Serbia, China, Switzerland and in his homeland Bulgaria, is on the move again. The 32-year-old has joined Bulgarian top-flight newcomers Botev Vratsa until the end of the year after leaving Croatian club HNK Rijeka. Amazing to think he was once considered one of the most promising players in Serie A when he became the youngest non-Italian to play in the league as a 15-year-old. Now that story about George Weah has got me thinking. I mean if he can play 79 minutes of an international fixture at the age of 51 then anything is possible isn't it (well within reason). So what would you still like to be able to do when you reach that age? Or if you're already there and beyond....What are you doing now that you didn't think would be possible a few years back. If you missed this earlier - Liberia fielded a special name during their 2-1 home defeat to Nigeria. President George Weah played at the age of 51, 11 years on from his last international appearance for his country. Weah, the first African footballer to win Fifa's World Player of the Year award, featured for 79 minutes of the game, arranged to retire their number 14 shirt, he wore at his playing peak. Now in case you missed this from yesterday this really is good. Yes it goes against the grain of everything we're told that a modern footballer should be, but then again there aren't too many Jon Parkin types knocking about these days. Crashes (car and a golf buggy) get a mention as does some interesting pre-match preparation and a meeting with Fabio Cannavaro. Just have a read of this from my colleague Ellie Thomason. 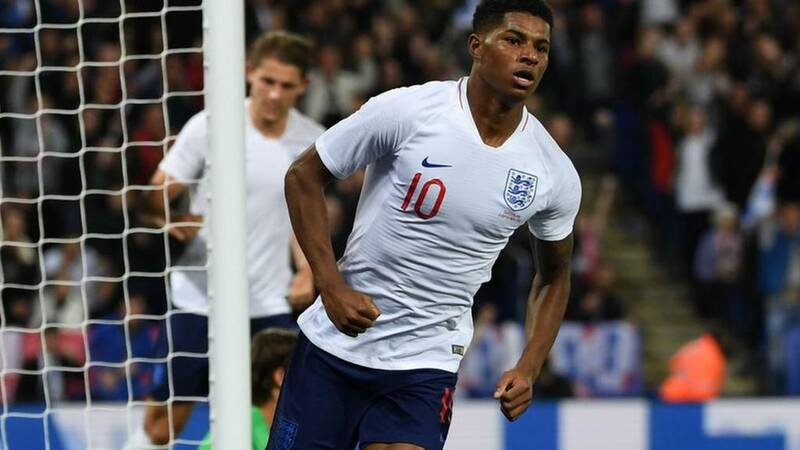 Here's what the England manager Gareth Southgate had to say about his match-winner Marcus Rashford. Everton forward Richarlison scored twice on his first start for Brazil as they beat El Salvador 5-0 at FedExField in Maryland. The 21-year-old won a penalty in the second minute, which was scored by Neymar for his 59th Brazil goal. He then doubled the lead with a curling strike, before Philippe Coutinho added a third. Richarlison swept home his second in the 50th minute, with Marquinhos heading home a fifth late on. Victory was Brazil's second in succession as they rebuild after exiting the World Cup at the quarter-final stage with defeat by Belgium. Eden Hazard and Romelu Lukaku scored as Belgium got their Nations League campaign off to a winning start in Iceland. Lukaku was bundled over by Sverrir Ingi Ingason in the box for a penalty that Chelsea midfielder Hazard converted to open the scoring. The Manchester United forward then got on the scoresheet himself two minutes later with a close-range finish and added the gloss with a deft flick nine minutes from the end. Does Kane need a break? Well Gary Neville certainly thinks so, expressing concern that Harry Kane is mentally exhausted. Kane won the Golden Boot at the World Cup in Russia scoring six goals, but he has not scored in his last five appearances for England. And Neville has questioned whether manager Gareth Southgate was right including his captain in match-day squads for both the Nations League opener against Spain and Tuesday's friendly with Switzerland. Neville said on Sky Sports: "I am concerned about Harry Kane. Since 2015 he has played 175 matches and he's struggling. Forget the physical side, he needs a mental break as well. "I don't think he should have been here for the two weeks. I think there is a welfare thing in terms of looking after players. "He has not had enough of a break since 2015." For those who aren't quite old enough to remember Paul Gascoigne as a player (like erm.. half the England squad), let me tell you he wasn't bad. He could pass, dribble and shoot and was instrumental in England's run to the World Cup semi-final at Italia 90. Now 51, his enthusiasm for the national team remains unwavering, though I'm glad Gareth Southgate didn't take him up on his offer to play last night. "It was lovely to see him. His passion for the game and for England is always huge. He's desperate for the young lads to go and do well and enjoy their football. "In terms of our players, they're aware of him, but (Marcus) Rashford was born in 97, Trent (Alexander-Arnold) in 98. That makes us all feel old, I guess." Now then. One-time mercurial England midfielder Paul Gascoigne has been having his say on current Three Lions boss Gareth Southgate. Southgate, was an international teammate of Gascoigne at Euro 96 and his former colleague has been glowing in his praise. "Gareth Southgate has got England playing the way football should be played," Gascoigne said. "It's the way they pass the ball about. They're young, they're strong and, I tell you what, they're enjoying their football. There's unbelievable talent there in the England team. "The guy is unbelievable. He's got England playing the way we want. All we've got to do is find the end product, putting the ball in the back of the net." Jamie Vardy's romantic evening also involved a quick chat with BBC Radio 5 live and he reiterated that he has not completely ruled out an England return. The 31-year-old, who has won 26 senior caps, said: “I’ve not closed the door completely. But the time was right to let the younger players come through." You're a Premier League footballer enjoying international retirement, spending more time with the family and of course having the freedom to get out for the odd romantic date night. So the first place you take your wife is....to your regular workplace, to watch England play football. Oh Jamie Vardy, your tactics are admirable.